Tag Archives for " Junaio "
One of the projections many folks had for this year was the growth of mobile applications that could use browsers, cameras, GPS and compass built into the current generation of phones to layer data on the view from a phone’s camera. The so-called augmented reality this produces is something that is amazing to witness and will become standard fare soon. 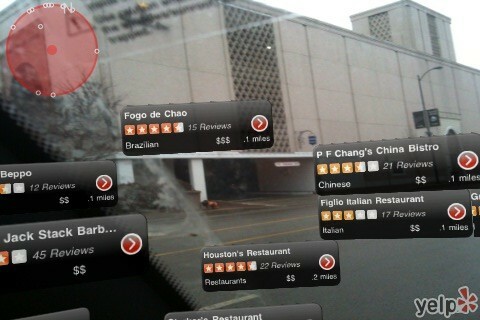 Yelp overlays reviews as the phone camera is pointed at businesses. College campuses are using it to make it easier for students to find classes, Commuters are using subway apps to find the nearest station Disney World has an app for the park, Yelp! provides reviews of businesses as you point your phone down the street, museums are giving guided tours with apps, and the YouTube app allows you to find videos people have made about places you are visiting. These applications will grow and eventually spill over into the small business arena as every day utilities. Augmented reality platform creators are making it much easier for anyone with a data source to build an app and bring it to the smart phone user. Sites like Layer and Junaio have built the framework for augmented reality application developers. Just today Rofo Partners announced that it is launching a commercial real estate augmented reality application with Junaio that allows people discover available office properties while driving down that street. So, what data could you overlay in an app? Menus, products, staff bios, success stories videos? If in the future a camera is pointed at you what will it say?